Colombo, the beautiful beach city and the capital city of island country SriLanka is on every traveler’s wish list. If you wish to witness the charm and beauty of this exotic place, get your Colombo flights booked on Rehlat - one of the fastest growing travel websites in the Middle East. We offer flights to Colombo on all major and popular airlines. You can opt to book for one-way or round trip. However, know that booking for roundtrip Colombo flights always helps you save huge. Book flights to Colombo at low fares with best price guarantee. Being one of the top rated tourist destinations in South Asia, Colombo has everything to attract visitors from all across the world. It is filled with some of the excellent tourist attractions including Independence Square, National Museum Sri Lanka, Colombo Fort, Viharamahadevi Park and Dehiwala Zoo, and much more. 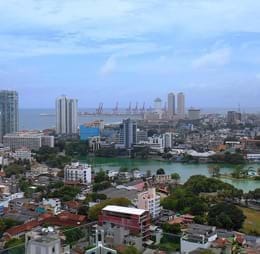 Colombo is an ideal place for fashionista and also shopping enthusiasts. You can find world-class selection of shopping options like clothing, handicrafts, high-quality goods, and souvenirs. The striking capital is filled with numerous shopping locations including Bauddhaloka Mawatha, DS Senanayake Mawatha, R A De Mel Mawatha, Galle, and much more. Colombo isn't only a beautiful tourist destination in Sri Lanka, but also a most prominent place for food lovers. Apart from the delicious local cuisine, you can also taste wide choice of international cuisines in many eateries. Colombo is home to numerous restaurants like Ministry of Crab, Mango Tree, the Sizzle, the Bavarian and the Lagoon. Colombo has a great nightlife with tapas bars, pubs, lounges, dance parties, and much more. Check out places for the best nightlife like Cleopatra Nightclub, Clique Colombo, W Lounge, Colombo Courtyard and The Kingsbury Hotel. Colombo has one of the largest transportation networks in the country. The local transport in Colombo is provided by an extensive network of operating modes including bus, train, taxi, car, and much more. The city buses offer easy and convenient way to travel across the city at an affordable cost. Bandaranaike International Airport is the major airport in Colombo that serves international and domestic flights to all major cities across the world. Located about 22 miles from north of the national capital Colombo, this airport is considered as the largest airport in the country in terms of international arrivals. The airport is a main hub for Cinnamon Air, Millennium Airlines, SriLankan Airlines and SriLankan Cargo. Bandaranaike International Airport has one terminal, Terminal 1. The terminal operates domestic and international operations. This airport is well equipped with money exchange counter, restaurants, duty free shops, taxi counters, and much more. Colombo airport offers different modes of transportation includes bus, car, and taxis to reach the city center. You can find plenty of Direct Express way public buses at an affordable cost. Radio taxis are available outside the airport arrivals, where you can enjoy a comfortable and pleasant journey to reach the city center.